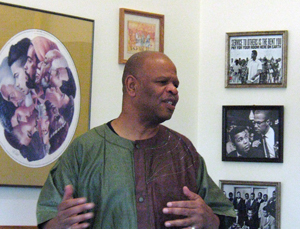 Seba Heru-Ka Anu as part of his historic visit to the Portland area addressed the TaNefer Ankh Community of Portland Oregon on the subject of establishing a Black Community towards realizing Black Power (On Tuesday, October 25, 2016). Sba, Anu spoke on the 'power of love' in the use of forging our relationships, in transformation of ourselves enabling the embrace of self and others. He gave the examples of Hon. Marcus Garvey, Hon. Malcolm X, and Hon. Dr. Martin L. King in their use of love in uniting Black people, and in the use of organizing and building. 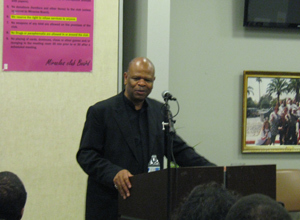 He stated that we should and must use love in creating our Community and enrolling our people to unity and action. 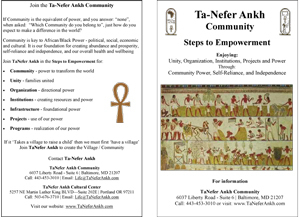 The Ta-Nefer Ankh Community is an international African-centered community-organization living a Kemetic Way of Life. 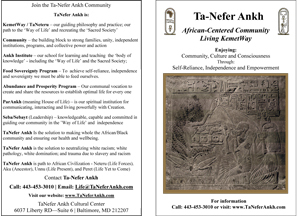 Ta-Nefer Ankh, meaning 'world of beautiful living', organizes African people to work together to establish unity, power and prosperity through community, organization, projects and programs. 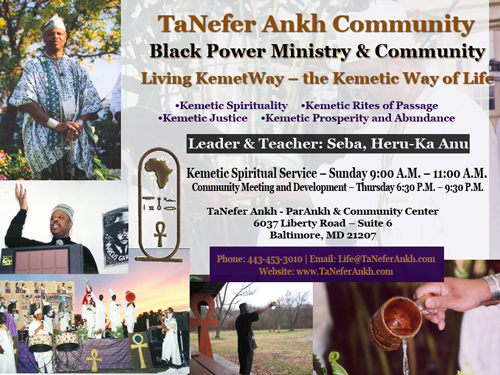 Through KemetWay our goal is to transform the life of our Ta-Nefer Ankh Community Members to one of abundance and prosperity. 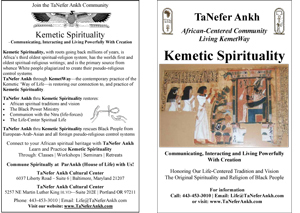 Today you can join Ta-Nefer Ankh and live the Way of Life. KemetWay is our culture, our guiding philosophy and practice. KemetWay is the contemporary expression of our ancestral Kemetic Way of Life -- the way of creating and maintaining righteousness, order, and balance; economic prosperity; personal and community character and development; and spiritual living. 1. Declare that you are embracing KemetWay - the Kemetic Way Of Life. You can enter into practicing KemetWay at any time, and at any stage, in your life. You do not need to know much of anything about KemetWay to begin, since you will be learning as you go. 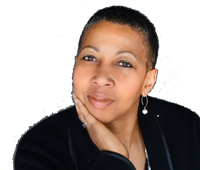 A consultation with a Ta-Nefer Ankh Seba will help you to know and understand the path you should be on towards achieving 'optimal-life'. The Seba will assist you in creating a Life-Map to chart your needs and responsibilities. Community is the source of power... If we are to establish Unity, Organization, Institutions, Projects and Programs, it is through Community that they occur and are sustained; without Community they flounder. Take a look around you and observe that each of these entities among African / Black people come and go without Community. TaNefer Ankh embraces and revels in heterosexuality as a standard of sanity, health and wellbeing; and as in keeping with the 'Way of Life'. Homosexuality is rejected, disdained and seen as pathological and destructive to human-beings - individual and societal. TaNefer Ankh recognizes homosexuality as anti-African/Black and as a White cultural pathology to be rejected without compromise. African Hetero-ProCreation perpetuates life, honors Nature/Creation, is healthy and self-perpetuating; whereas Euro-White Homo-Sexual Pathology negates life, disregards Nature/Creation, is destructive and self-negating. 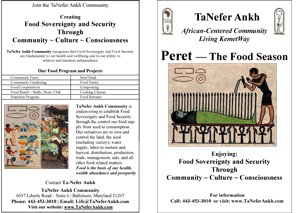 TaNefer Ankh celebrates and reveres Nature/Creation and the 'Way of Life'; and rejects that which is counter to Life. 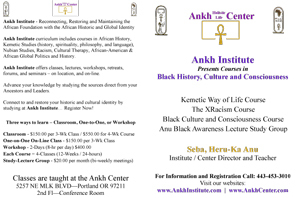 Ankh Institute the education arm of TaNefer Ankh provides a curriculum for the development of the healthy African-centered mind. 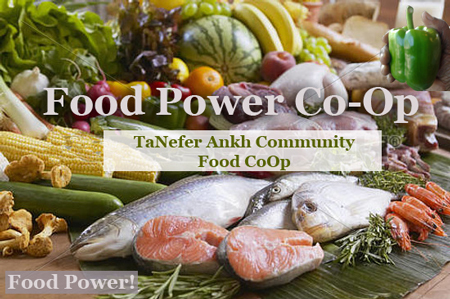 In keeping with the Food Sovereignty/Food Security goals and objectives the TaNeferAnkh Community of Portland Oregon has launched the Food Power Co-Op. 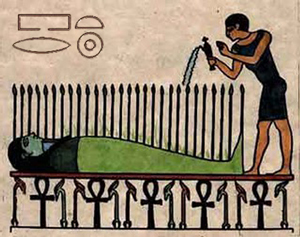 Peret is celebrated by TaNefer Ankh from the Spring Equinox to the Summer Solstice (mid-March - mid-June). During this time period we focus on and endeavor to generate food in abundance. Sunday: 5:00 P.M. - 7:00 P.M.
Wednesday: 7:00 P.M. - 9:00 P.M.